How much time have you spent looking for lost room keys in an untidy and messy house? It happens to the best of us and till date remains an incredibly frustrating experience. But what if a simple computer algorithm could locate your keys in a matter of milliseconds? That is the power of object detection algorithms. While this was a simple example, the applications of object detection span multiple and diverse industries, from round-the-clock surveillance to real-time vehicle detection in smart cities. In short, these are powerful deep learning algorithms. 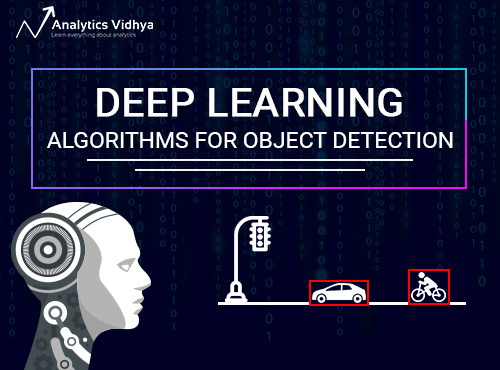 In this article specifically, we will dive deeper and look at various algorithms that can be used for object detection. We will start with the algorithms belonging to RCNN family, i.e. RCNN, Fast RCNN and Faster RCNN. In the upcoming article of this series, we will cover more advanced algorithms like YOLO, SSD, etc. I encourage you to go through this previous article on object detection, where we cover the basics of this wonderful technique and show you an implementation in Python using the ImageAI library. The below image is a popular example of illustrating how an object detection algorithm works. Each object in the image, from a person to a kite, have been located and identified with a certain level of precision. Let’s start with the simplest deep learning approach, and a widely used one, for detecting objects in images – Convolutional Neural Networks or CNNs. 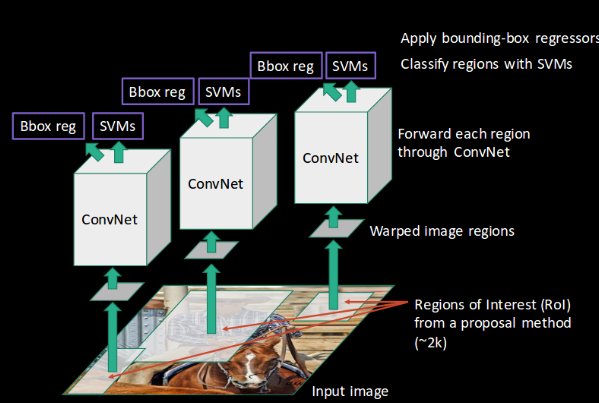 If your understanding of CNNs is a little rusty, I recommend going through this article first. We pass an image to the network, and it is then sent through various convolutions and pooling layers. Finally, we get the output in the form of the object’s class. Fairly straightforward, isn’t it? For each input image, we get a corresponding class as an output. Can we use this technique to detect various objects in an image? Yes, we can! Let’s look at how we can solve a general object detection problem using a CNN. 3. We will then consider each region as a separate image. 4. Pass all these regions (images) to the CNN and classify them into various classes. The problem with using this approach is that the objects in the image can have different aspect ratios and spatial locations. For instance, in some cases the object might be covering most of the image, while in others the object might only be covering a small percentage of the image. The shapes of the objects might also be different (happens a lot in real-life use cases). As a result of these factors, we would require a very large number of regions resulting in a huge amount of computational time. So to solve this problem and reduce the number of regions, we can use region-based CNN, which selects the regions using a proposal method. Let’s understand what this region-based CNN can do for us. Instead of working on a massive number of regions, the RCNN algorithm proposes a bunch of boxes in the image and checks if any of these boxes contain any object. 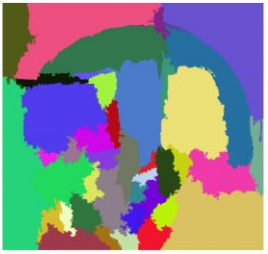 RCNN uses selective search to extract these boxes from an image (these boxes are called regions). Finally, these regions then produce the final object locations (Region of Interest). We first take a pre-trained convolutional neural network. Then, this model is retrained. We train the last layer of the network based on the number of classes that need to be detected. The third step is to get the Region of Interest for each image. We then reshape all these regions so that they can match the CNN input size. After getting the regions, we train SVM to classify objects and background. For each class, we train one binary SVM. Finally, we train a linear regression model to generate tighter bounding boxes for each identified object in the image. You might get a better idea of the above steps with a visual example (Images for the example shown below are taken from this paper) . So let’s take one! And this, in a nutshell, is how an RCNN helps us to detect objects. Regression model for tightening the bounding boxes. All these processes combine to make RCNN very slow. It takes around 40-50 seconds to make predictions for each new image, which essentially makes the model cumbersome and practically impossible to build when faced with a gigantic dataset. Here’s the good news – we have another object detection technique which fixes most of the limitations we saw in RCNN. What else can we do to reduce the computation time a RCNN algorithm typically takes? Instead of running a CNN 2,000 times per image, we can run it just once per image and get all the regions of interest (regions containing some object). 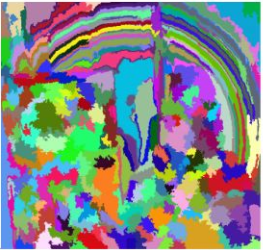 Ross Girshick, the author of RCNN, came up with this idea of running the CNN just once per image and then finding a way to share that computation across the 2,000 regions. 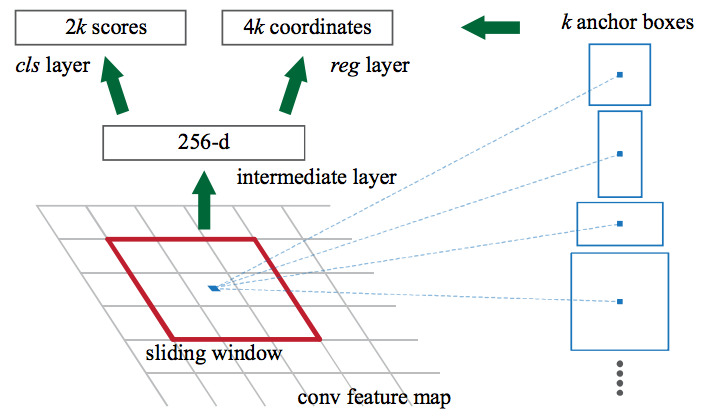 In Fast RCNN, we feed the input image to the CNN, which in turn generates the convolutional feature maps. Using these maps, the regions of proposals are extracted. We then use a RoI pooling layer to reshape all the proposed regions into a fixed size, so that it can be fed into a fully connected network. As with the earlier two techniques, we take an image as an input. This image is passed to a ConvNet which in turns generates the Regions of Interest. 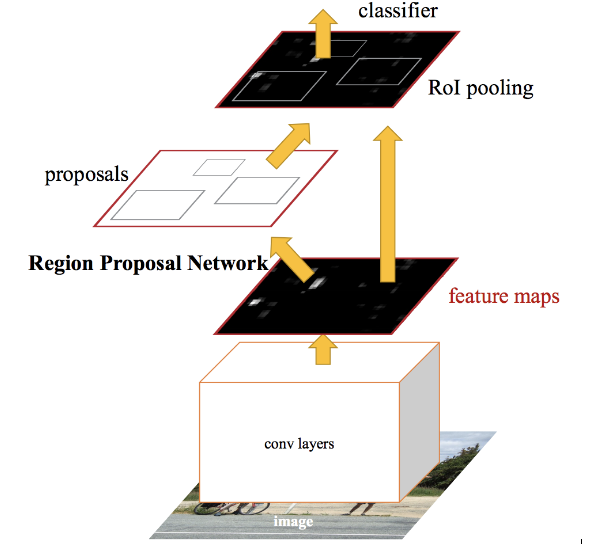 A RoI pooling layer is applied on all of these regions to reshape them as per the input of the ConvNet. Then, each region is passed on to a fully connected network. A softmax layer is used on top of the fully connected network to output classes. Along with the softmax layer, a linear regression layer is also used parallely to output bounding box coordinates for predicted classes. So, instead of using three different models (like in RCNN), Fast RCNN uses a single model which extracts features from the regions, divides them into different classes, and returns the boundary boxes for the identified classes simultaneously. To break this down even further, I’ll visualize each step to add a practical angle to the explanation. 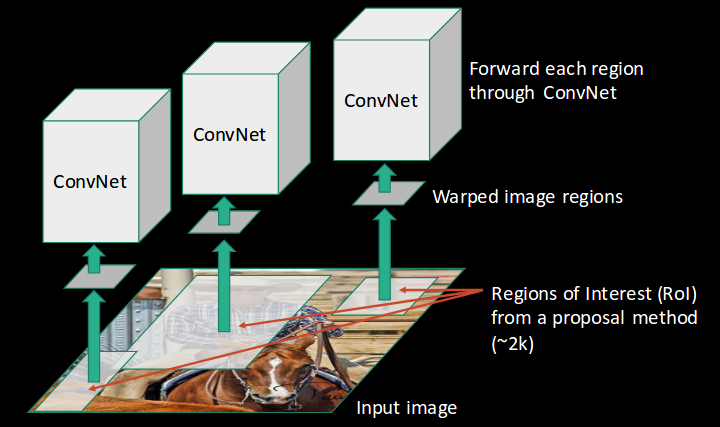 This is how Fast RCNN resolves two major issues of RCNN, i.e., passing one instead of 2,000 regions per image to the ConvNet, and using one instead of three different models for extracting features, classification and generating bounding boxes. But even Fast RCNN has certain problem areas. It also uses selective search as a proposal method to find the Regions of Interest, which is a slow and time consuming process. It takes around 2 seconds per image to detect objects, which is much better compared to RCNN. But when we consider large real-life datasets, then even a Fast RCNN doesn’t look so fast anymore. But there’s yet another object detection algorithm that trump Fast RCNN. And something tells me you won’t be surprised by it’s name. Faster RCNN is the modified version of Fast RCNN. The major difference between them is that Fast RCNN uses selective search for generating Regions of Interest, while Faster RCNN uses “Region Proposal Network”, aka RPN. RPN takes image feature maps as an input and generates a set of object proposals, each with an objectness score as output. 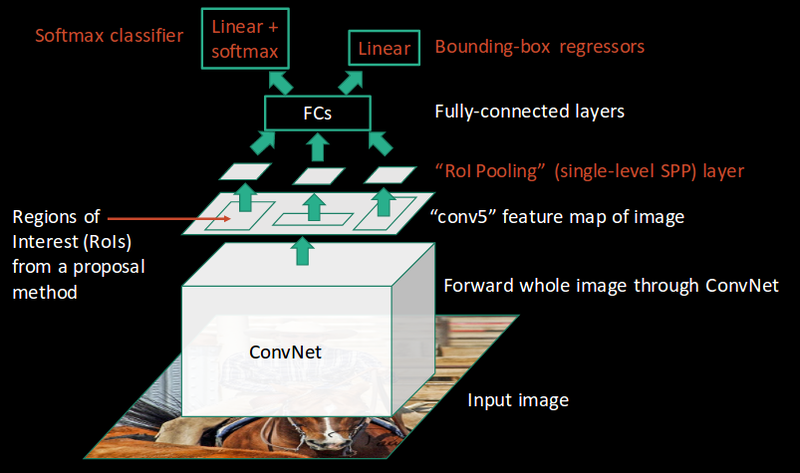 We take an image as input and pass it to the ConvNet which returns the feature map for that image. Region proposal network is applied on these feature maps. This returns the object proposals along with their objectness score. A RoI pooling layer is applied on these proposals to bring down all the proposals to the same size. Finally, the proposals are passed to a fully connected layer which has a softmax layer and a linear regression layer at its top, to classify and output the bounding boxes for objects. Let me briefly explain how this Region Proposal Network (RPN) actually works. Then these feature maps are passed to a fully connected layer which has a softmax and a linear regression layer. It finally classifies the object and predicts the bounding boxes for the identified objects. The below table is a nice summary of all the algorithms we have covered in this article. I suggest keeping this handy next time you’re working on an object detection challenge! CNN Divides the image into multiple regions and then classify each region into various classes. – Needs a lot of regions to predict accurately and hence high computation time. RCNN Uses selective search to generate regions. Extracts around 2000 regions from each image. 40-50 seconds High computation time as each region is passed to the CNN separately also it uses three different model for making predictions. Fast RCNN Each image is passed only once to the CNN and feature maps are extracted. Selective search is used on these maps to generate predictions. 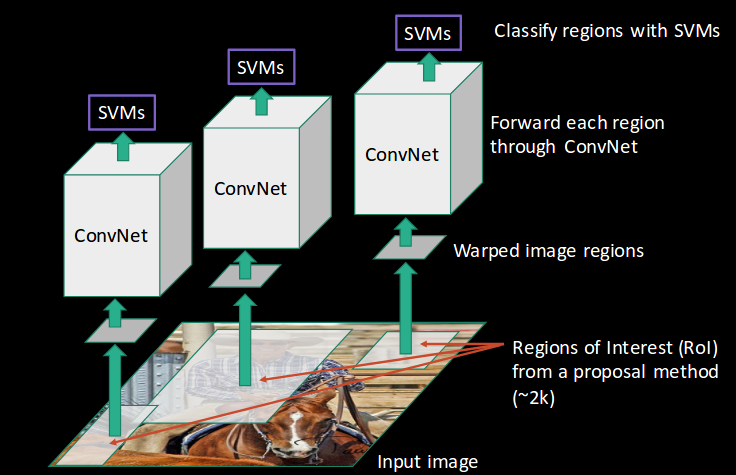 Combines all the three models used in RCNN together. 2 seconds Selective search is slow and hence computation time is still high. Faster RCNN Replaces the selective search method with region proposal network which made the algorithm much faster. 0.2 seconds Object proposal takes time and as there are different systems working one after the other, the performance of systems depends on how the previous system has performed. Object detection is a fascinating field, and is rightly seeing a ton of traction in commercial, as well as research applications. Thanks to advances in modern hardware and computational resources, breakthroughs in this space have been quick and ground-breaking. 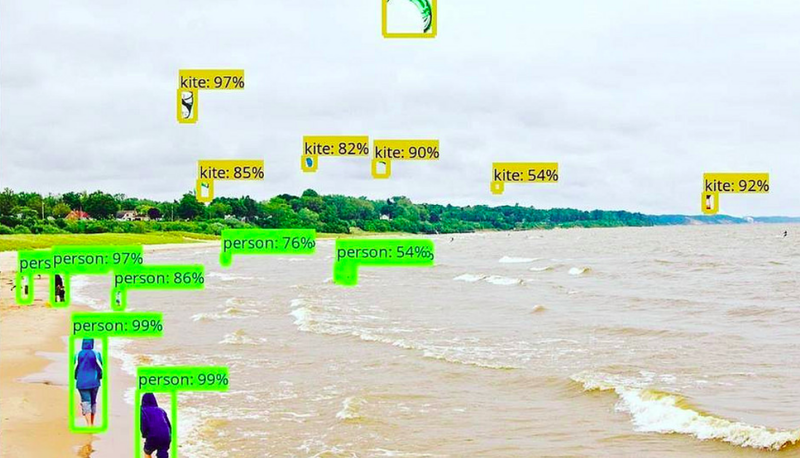 This article is just the beginning of our object detection journey. In the next article of this series, we will encounter modern object detection algorithms such as YOLO and RetinaNet. So stay tuned! I always appreciate any feedback or suggestions on my articles, so please feel free to connect with me in the comments section below. Very interesting paper. Good job!!! Excellent Article..Really its helpfull for beginers..Thanks a lot..!! Interesting that you compiled so much information in a relatively very easy manner to grasp. Any GPU will work. It will reduce the training time of the model. There will not be any effect on the model performance. I am new to the neural network. but this seems to be very interesting. Glad you liked it Himakar! Thanks for writing, it really helps me to get started in Object Detection. In 2019, can you tell which one is best for object detection? It all depends on the type of problem and images that you are dealing with. Personally, I would start with YOLO as it is faster and performs equally well as compared to faster rcnn. But you can try different algorithms too depending on the problem at hand. If you want to understand how YOLO works and look at its implementation, you can refer to this blog. Can you please be more specific with your question? That would help me to clarify your doubt in a better way. Are you starting with Neural Network and want some references? or is it something else? Here are the part 2 and part 3 of this series of article. Nicely structured article Pulkit. Just wanted to ask something. Did you implement all three methods to compare the performance? If you have have could you please post the github link or something. I have implemented the Faster RCNN and have also written a blog on it. Have a look at the blog. I hope it will be helpful for you.